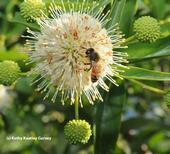 Honey bees: Should they be banned from native plant restoration areas? What’s a honey bee to do? The dwindling resources of pollen and nectar-producing plants in California greatly concern bee scientists and beekeepers, and rightfully so. 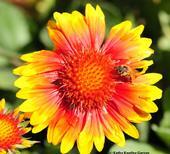 But the dwindling resources also greatly concern native pollinator specialists and native plant enthusiasts. Some worry that honey bees, which are non-natives, may be "reducing" or "eliminating" native pollinators through competition for food. Colony collapse disorder (CCD) has certainly increased public awareness about bees — but also public misinformation about bees in general. CCD, the mysterious phenomenon characterized by adult bees abandoning the hive, leaving behind the queen bee, immature brood and stored food, surfaced in the winter of 2006. Scientists believe CCD is caused by multiple factors: diseases, viruses, pesticides, pests, malnutrition and stress.